I’d never done a face to face interview before, and who better to start with than the 2005 World Champions Team Cutting Edge? For the previous 11 years, the World Championships have gone to European teams, proving themselves dominant in the sport of team flying… However, the members of Cutting Edge had their palates teased with a 3rd place in 2004, giving them the drive to come back en force with a desire and combined ability that brought them the win out of fifteen teams representing seven different countries. Not usually being a chatty guy, but having been on a few teams myself, I found the conversation between Jim, Jerry, Rick and myself very easy, inspiring, and I think we all had a great deal of fun with it. They were all willing to share their experiences with our readers, and showed themselves to be three of the nicest guys you’ll ever meet. The following interview is nearly 100% word for word what I got on tape to show the interaction and how each member contributes their own influence… Read on and enjoy, I know I did. How long has TCE been in existence, and what brought it into being? Jim – Team Cutting Edge is on their second year. 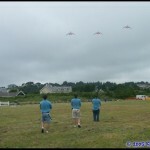 Rick and I have flown together on Visual Impact which was formed from two other teams (Don’t Panic and Bumperkites). 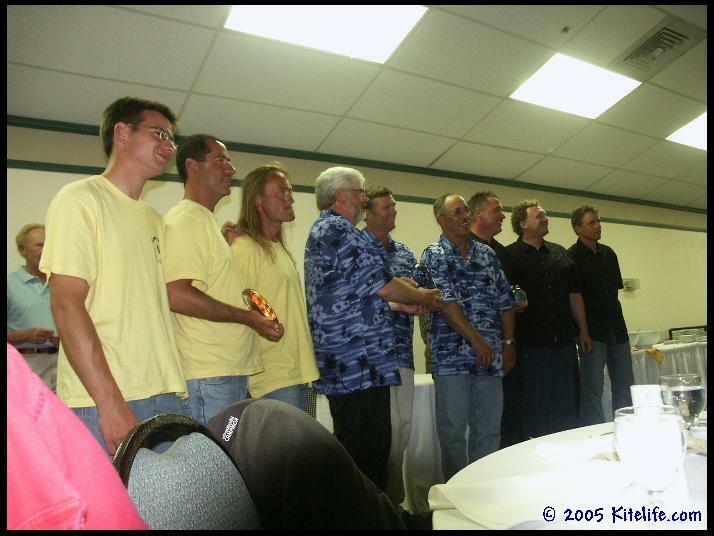 We came together after the Ocean Shores AKA Grand Nationals… We put Visual Impact together to be a championship team, and for the two years we flew under that name there were no world championships held. Both of us kind of lost heart after that, I quit flying for a couple of years while Rick continued to fly pairs (with son Reid Wolcott as R.A.W. 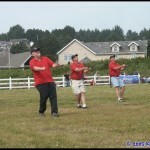 Power), and that’s when Mike Huff and I put the Northwest Sport Kite League together. 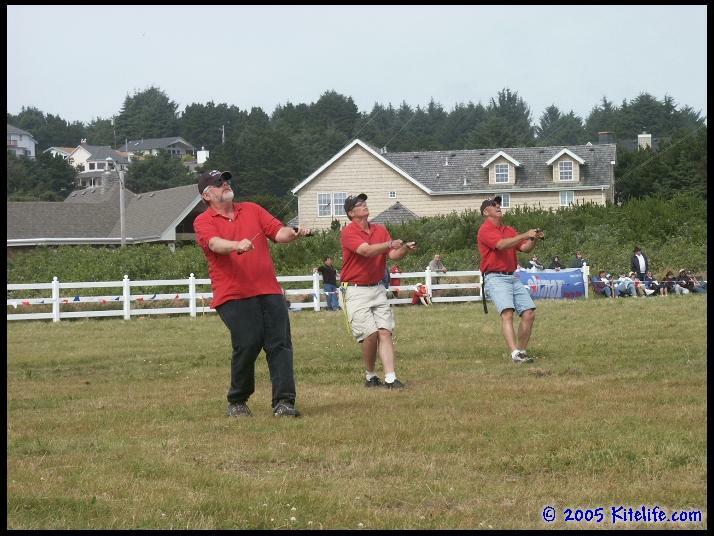 After two years, we kept hearing about the World Sport Kite Championships (WSKC) coming together in Berck, France, so we were getting antsy… We kept talking about it, so it came down to well, let’s find a third person! And we both went home and came up with five names of who that third person could be, we went over the common names first, and the one name that was on the top of both of our lists was Jerry (Cannon). Jerry – Still hard too believe (laughing). When Team Cutting Edge came together, was it agreed that this was going to be a team specifically formed for championship flying? Jim –It was for Rick and me. Jerry – I questioned it when they asked if I wanted to fly with them… What are the criteria that we’re looking for, what are we going to try to accomplish, what kind of commitment you want… It was “we’ll try to get together every other weekend, we’ll work together and see if we can fly together, see if it all works.” After our third practice, it was “we’re going to nationals” and we started banging it out every weekend, and it came together. It was a struggle; I wasn’t used to Rick’s choreography style of not writing a thing down on paper… I mean, I got to see it… So we developed some things that helped us tremendously, it went from there; it was one of those… It worked. Now of course, all three of you were experienced competitors when you formed the team, but how long do you think it took for the personalities to sort of, get that feeling out process done with in terms of coming to a real synchronization? Rick – I thought it came together pretty quickly… The flying styles were a factor, Jerry had a very different style from us, but we adapted pretty quickly. And the personalities meshed pretty well. Jerry – I’m my worst critic, and Rick was able to take me from getting down on myself to backing up a little and getting a different perspective. Each one of us has things that we do for the other guy… These two (nods at Rick and Jim) know each other like a book, so they’ve worked with each other. Jerry – Rick is the one that lifted me up, you know, when you got a problem to let it go. 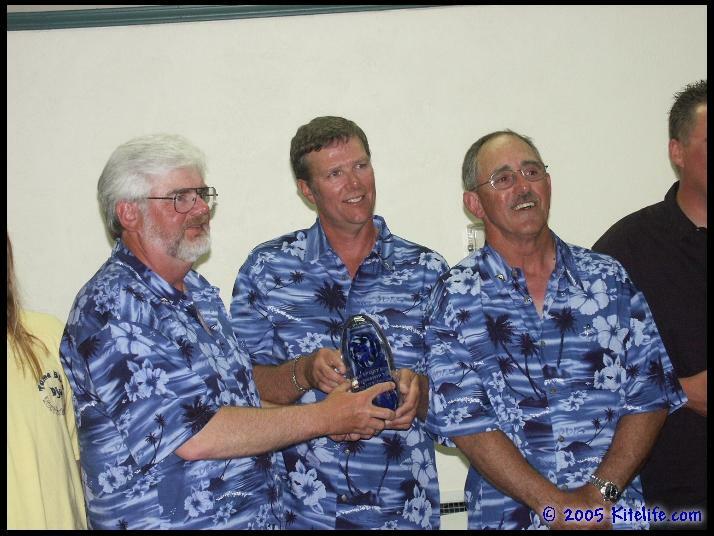 Jim – When we first put it together, I had not flown competitively in a couple of years, and Jerry had not flown team period. So we had a gelling period, our goal in the first year was just to put it together, make it function. And then next year, we were to going to make a run at it. Well, it ended up in the first year we took 2nd at Nationals I think, and we ended up getting invited to Berck. And we were really like, “hey, we’re a little out of our league here” but we put our heads down and we started working at it, and things gelled better and better for us, and we ended up going there and taking third. So a real interesting scenario has occurred, Rick and I (as have many other team fliers) have been working towards this goal for a long time, Jerry *laughs*… There are a lot of team fliers who are going to grit their teeth when they read this, Jerry has been flying team for two years, has a third as well as a first in the WSKC. That’s tough to hear, but you know it’s awesome. What year did each of you start flying individually? 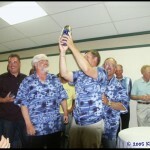 Qualifying for WSKC right off in your first year, tell me about the feeling of coming in 3rd? Jerry – When they announced 4th, and our name in 3rd… We were hoping for top five, it was beyond my wildest dreams. Rick – Beforehand we had talked to some of the judges, they said “you did this nice”, and so on… We thought, oh no. Jim – Rick and I were pretty confident that we were 5th or better… Next thing we knew we were on the podium and for me that was bigger than the win this year. Rick – I don’t know about that (laughing). Jim – When we came back this year, we were ready for a battle, ready for a war… Coming in 3rd last year, it gave us the confidence. We knew we could fly together at a world level. Rick – Last year with the old routine, it was held back… Jerry was trying to learn and get a feel for the team, and we kept things simpler. 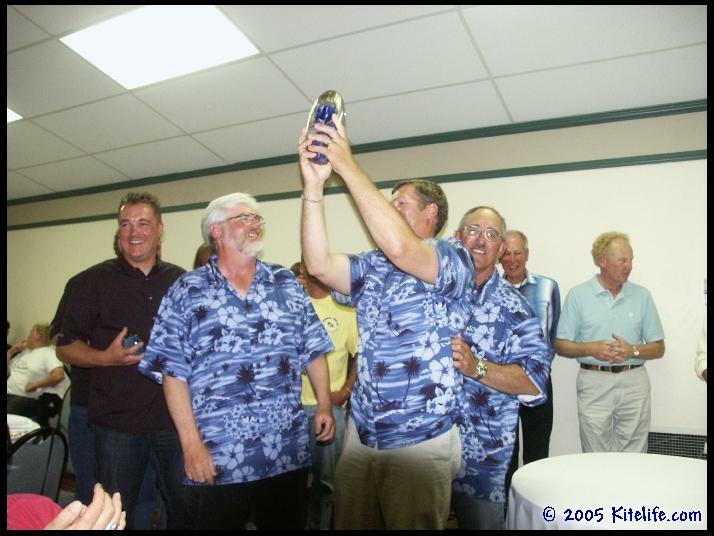 During most of this year’s WSKC, you guys and Tame Bird were obviously pushing neck and neck the whole way, how did that pressure affect your performance… Was it a rattling factor, or did it push you harder? Jerry – Each one of us thought the same thing, step it up a notch… It wasn’t about going out there and beating Tame Bird. It was about flying better than we did before. Rick’s famous saying is, fly like you mean it. We stayed focused and didn’t realize how high the juice level was until we found out the results. Jim – Don’t misunderstand, we’re listening to their scores, but all we can is concentrate on what we’re doing. We talked about what happened last time, what we needed to do to fly better ourselves, not better than Tame Bird, just better than we did the time before. Rick, this question may be best suited for you as the one who writes a lot of your routine… What are some of the things you changed with regard to dynamics and difficulty compared to last year? Rick – Obviously in the ballet routine we were trying to make it more aggressive, to give it higher impact and complexity. Jim – What we did in the precision is very obvious. The first thing when we got back from Berck was to tighten up our spacing, get closer and closer… So, immediately upon getting back, that’s what we started working on. That’s reflected in the precision, you can see in everything that we’re doing, that’s primarily what we worked on. Rick – In ballet it’s a lot more dynamic, much more of a complex routine than our old one. In developing your routines and changing your style, did you draw inspiration from other teams on video? And if so, were there certain ones that lent to your style, or that you found resonance with? Rick – Obviously there’s a Sky Dance type of influence… But all in all, there are a lot of different influences mixed in there with our style. Now, while working on and practicing this routine did the team do much self-review on video? Jerry – Yes, I did (laughing)! One was one of the best tools that these guys came up with was the videoing of stick practice… Burned it onto CD and took it to work, which was crucial for me. Rick – I refuse to draw it [the routine] out on a piece of paper, it’s all in my head… It would drive me absolutely bananas to sit down and draw every piece. Jerry – Our first routine I had on paper, I insisted on having it on paper… With this one, we’d take sections, work on it with sticks, then take it outside and fly it. Rick – Doing it on video made it so much more understandable, so much easier to develop and memorize as opposed to putting it down on a piece of paper… It’s a great tool. What do you think some of the advantages or disadvantages there might be to flying a three-man configuration compared to the usual four-man or even-number configuration? Jim – That’s an excellent question… Some of us have flown with three, four, five, and for a short period, six. The first thing you see, is that with a bigger team you can be a little less precise because it’s a big show, it’s easier to wow. The bigger the team, you can start dropping off some of the exact timing kind of things and wow them more with having a whole lot of stuff going on. The smaller the team gets, the faster things have got to be to keep the same attention level, to keep the same show. Things have got to be happening quickly and very precisely with a whole lot of fire behind it. Spacing has to be cleaner, everything has to be more technical and done better in order to match the bigger teams… I think Sky Dance really showed that. Rick – I like the concept of being fast and aggressive, I don’t like the slow style… We really wanted to get the aggressiveness to show out there. I’d rather go for it, or fly like you mean it… That’s my approach to things; I always like to fly like there’s at least one less person on the team… If you’re a three-person team, I want fly at the speed of a pairs team, to be faster and more dynamic. Do you feel like flying with three gives you more room in the sky to accomplish that? Jim – And I think it suits our flying style better, that’s what Rick and I like to do, and now Jerry. Now Jerry, you had a much softer and elegant flying style before joining the team? Rick – We told him up front, that was something you got to work on. Jerry – Yeah, it was an adjustment in my style, from low and slow to hard and fast. How does the team divide responsibilities such as creating routines and maintaining equipment? Rick – There is much more back and forth with the precision routine… I’m ballet; I have total control on that. Jim – I run the team in precision, and Jerry is definitely the team engineer… Sometimes I’ve told people that and they laugh, but you’ve got to know he’s got a major job… He keeps all the kites tuned, he developed our vented kites for us because in many cases when we’d flown, there weren’t vented models or the ones we did have didn’t work to well. So he’s the one who has the patience to go down to the beach for hours at a time and develop that kind of stuff for us. Rick – He loves doing it, and we’re not the people that like doing that. Jerry – Rick just wants to pick it up and fly… When I first heard “team engineer” I thought it kind of sucked, you know… “I want to be in charge of ballet or precision.” but what I do is just as important. I like fixing and changing, knowing that everything is in shape, somebody’s got to do it… Jim is the precision wizard, Rick is the ballet wizard, guess what I am… I’m the kite wizard, I like doing it. Jim – It is major, having someone on the team who is good at it and has the patience to do it… It is huge. He’s come up with some things on making the kites do what we want that normally would have taken forever to figure out… And he pops up with it pretty quick. 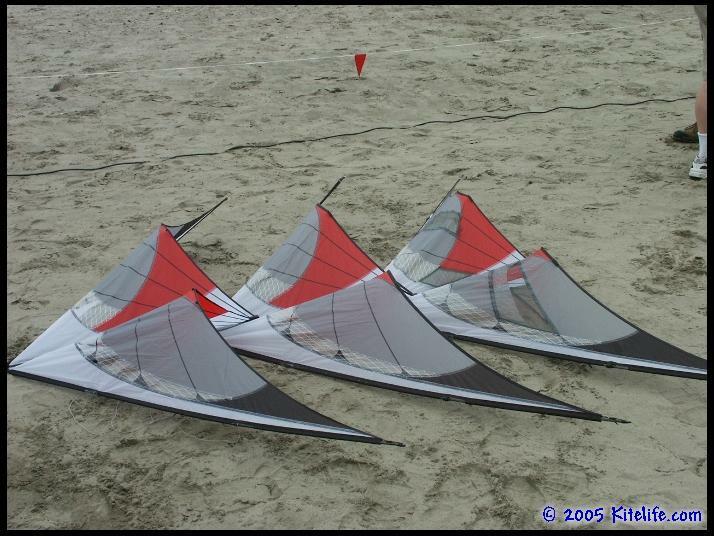 You made pretty significant change in kites by going from the Next by Jeff Howard in 2004 to Prism’s Quantum Pro in 2005… What initiated that? Jim – There we some specific things that we wanted to do in the routine that the Next just didn’t do well enough for how we wanted to do it… It’s a great competition kite, a really great competition kite, but every kite has its things that it will and won’t do. After trying to get the situation sorted out through testing other kites, someone handed me the Quantum Pro and said “fly this, see what you think”… It was like, yeah! This kite’s got my personality all over it, and I then got these guys to try it. Jim – Which didn’t exist, and kind of still don’t exist! But they’ve been designed now, and so what Prism will do with them, we don’t know. Jerry – We went out to lunch one day and I gave Mark Reed, of Prism, a drawing of a vented Quantum Pro… He built the kite, and on the first test flight he did every trick he does with the standard… His smile just kept getting bigger and bigger, so he went back to the shop and built us three vents with Velcro and Mylar patches. Mark is very particular about the look of a kite, so to put it in where it was already designed in was perfect… He went along with it, built it and viola; we got one of the best vented kites out there. 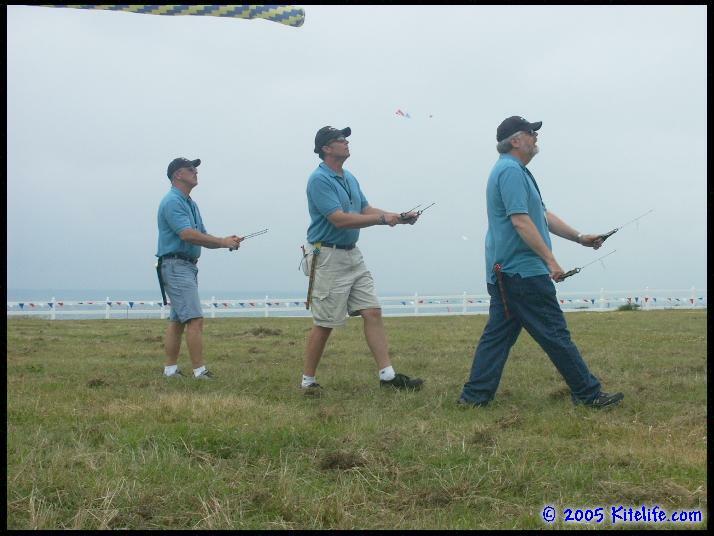 Jim – We did fly that kite on two of the days at WSKC, it saw more air time at the championships than any other kite we got. Behind almost any good team is a great supporting cast, so who put up with the long practices and gave you that much needed support? Rick – The trophy wives, of course. 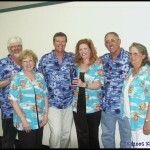 Jim – The self-named trophy wives, Monica, Marcia and Eileen. 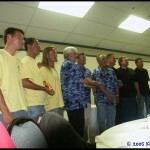 Jerry – All of our wives were incredibly supportive. Team sponsors, who are they and what kind of support do they provide? Jim – Prism obviously for kites. Cutting Edge Kite Shop which we’re named after, LaserPro (lines), Skyshark (spars), Go Fly a Kite (jackets, coats), Mariah Kites (banner) and Things Aloft (kite bags). Our primary sponsors are Cutting Edge and Prism. Jerry – One little note, when we decided to fly the Quantum Pro… Prism agreed to build a UL and a vent, and then Mark proceeded to blow out his knee and spent 6 weeks getting back on his feet. 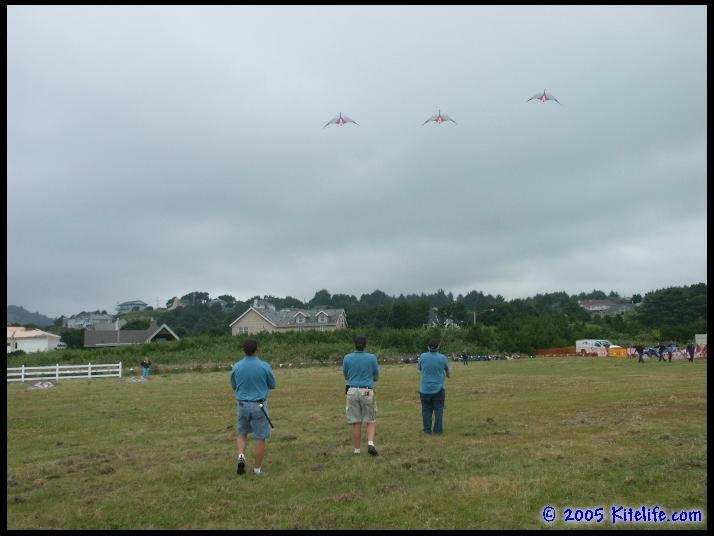 Jim – So that’s the other thing, we only actually had our kites for a very short period of time before we went to the championships… We didn’t get the vent and ultra light model until real close to the end because he couldn’t do anything about it. He couldn’t test fly, he couldn’t even walk for quite awhile… We were getting very nervous. 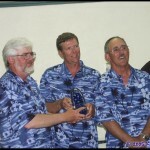 The thing that was nice about the whole thing though, was winning the WSKC in the USA, flying USA made kites. Rick – That was very cool. Based on what you saw at this year’s WSKC, who are you looking at to be real contenders next year? Jim – If Tame Bird stays together, they’ve been awesome every time I’ve seen them… They’ve been awesome. And Elément’Air, you can’t write them off… They just had a rough go; they are an incredibly good team. I hope Kamikaze stays together, they’re three of the neatest people I’ve ever met, and they’re incredibly friendly people, wonderful fliers… They could be there at any given moment. Watnu, I think their ability is going to jump up now that they got close. 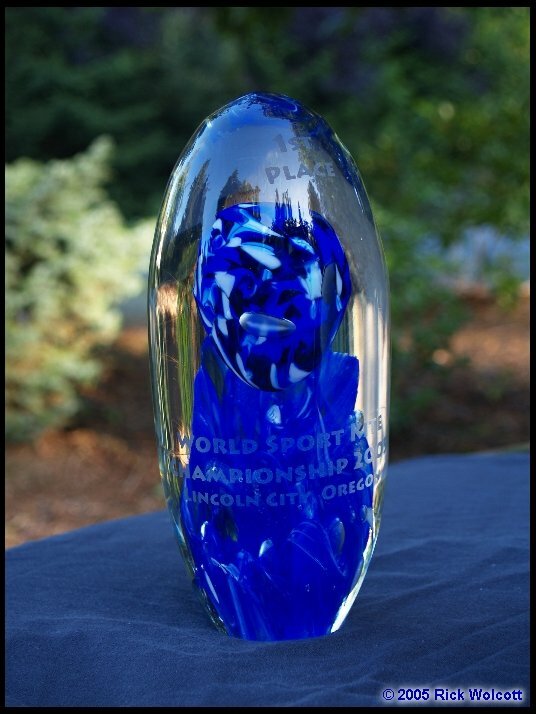 Rick – Now that they got that third place, I think that will probably pump them up. 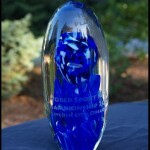 Jerry – One of the comments Watnu made to me was, third place this year means first place next year… So they got really jazzed over it. Jim – Another great team to keep an eye on for next year, Air-Rex from Japan. Rick – If they can get their precision routine up there, they’re going to be in the top five. So, one of the big questions… Is Team Cutting Edge going to make a defending run at the championship in 2006? Jim – My feeling is, I want to win it twice… And then you’ll probably not see me again in a competition type of role, but I’d love to win it twice. Jerry – I’ve already got the sense from both of these guys that defending the title is paramount, I want to go back to France… I want to fly in France, and bring home another trophy. Rick – That’s going to be harder… This event here could have gone either way, Tame Bird or us… It’s one of those things, here it might be us, and in France it might be them. Jerry – One of the greatest advantages we had this year, the Northwest USA fliers that showed up… Thirty or forty of them showed up every day, screaming their guts out… That was huge. Jim – To hear them screaming out there, it pumps you up… It really does, it just kind of keeps you in it. Jerry – It jazzes you, it really does. 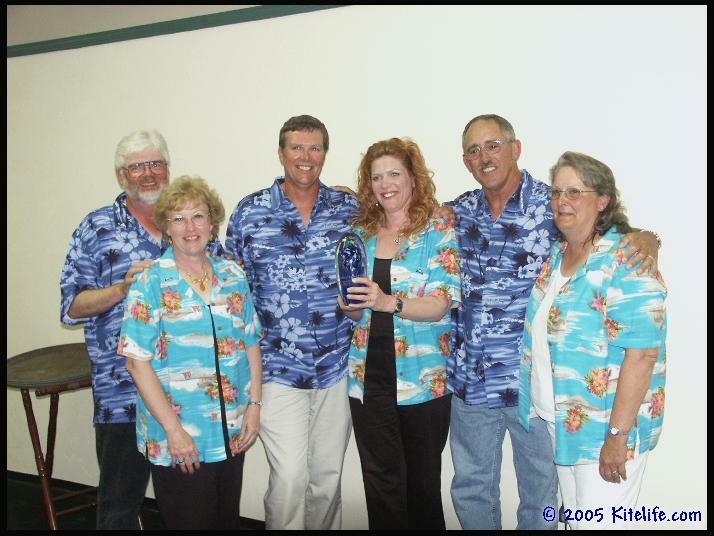 So, tell us about coming home to Ocean Shores after winning the WSKC? Rick – The one thing that was really nice, we came home Saturday evening after the event… And all over town, there were congratulations everywhere… You went by the casino, the grocery store, all the motels and hotels, had “Congratulations Team Cutting Edge” on their signs out front. That was really sweet, very nice. Do you have any comments for the teams that are looking upwards, and possibly striving to follow in your foot steps? Jerry – Practice. 99% of why we got where we got is because of the dedication… Go out at ten o’clock in the morning and go back at four in the afternoon. It’s serious practice, it takes dedicated practice. Rick – And preparedness… You prepare for all the bad things that can happen, and provide alternatives. We even went out and practiced in a park with trees all around. 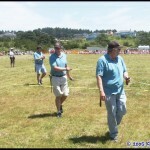 Jim – We’re probably in one of the best places on the west coast for kite flying. You don’t get any better than where we live… So we had to wander over into some nasty parks surrounded by trees and practice knowing that we’re ten minutes from a kite flying Eden, you know, but that’s what you have to do… We had to put ourselves in that scenario. We actually create bad scenarios in our practice, like before we went to France we’d be working on precision which I make the calls for, and suddenly in the middle I’d tell Rick to take over and he’d have to finish making the calls…You know, what if I got a sore throat or lost my voice? So we take those things into account. You know during a routine especially in rough conditions, things are going to go awry; something is going to happen… What you want to separate you from the other teams is how cleanly and how quickly you get out of the problem. You don’t want it to look like there’s chaos going on, you want to get everybody’s head back in, and get the kites back in as quickly as possible so we practice those scenarios. Rick – If the wind conditions are up or down, we build in alternate calls to gain ground or take out axels… You know, alternate game plans. Jim – It depends on the conditions… For example, we have team cascades/half axles for good technical points, but if the winds are up, are you better attempting them and making them look sloppy or maybe just doing a rollover perfectly together. So you just have to make that call. Jerry – Whichever we’re doing, Rick on the ballet and Jim on the precision… Final word is theirs. We go out there, and if one of them determines that a change should be made, it stands. Jim – Because you don’t want to be arguing about it, what’s the point, you don’t have time… It is what it is, do it. Rick – Being prepared, all these trouble situations… Learn to deal with it. Jim – Any time you’ve got three, four, five people out there in nasty conditions, you’re going to have problems… And so, you want to design ways to get through and out of them as quickly as possible. 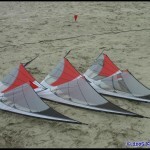 Also, to up and coming teams… My god, remember… They’re only kites, remember that. You’re spending some intense, long hours together. Use that time to become good friends, not enemies… It’s not a nuclear war, you know? Rick – All our comments/ribbing is good hearted… We’re out there trying to help each other; we’re not out there to complain about somebody else. It’s more like, if you’re having a problem… Work it out. Jerry – I remember what Rick said to me one time, I made the comment “I can’t wait to fly the perfect routine”… He said, “Ain’t going to happen”. Jerry – I kind of got deflated a little bit, but it brought me to a reality… We’re always going to have something that is not working just right. There are three different people flying, oh yeah! To me, Jim’s point about being able to get out of bad situations, you’ve got to talk about them. In trouble situations you just have to stay calm, stay quiet, look for the opportunity, find the beat, find where they’re at, and then go… It works. Jim – Work and have fun… Have a goal, sit the team down, ask everybody – what is it you want to achieve, what is your goal for this team? That helps a lot. If there’s a problem, something’s happening and you’re having trouble figuring it out, instead of pointing fingers, video it… The tape doesn’t lie, and when the tape is playing whoever is doing it will look at the tape and go, “Oh man,” and it’ll take care of itself. You can cut hours and hours off by using video tape; it is also an incredible tool for compulsories… As boring as they are, they are the best tool you have for learning to fly together, compulsories. 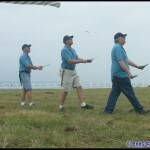 Hammer on them and you will get your timing together and learn how to fly as a unit. Rick – We probably spend a lot more time on compulsories than other teams do, a great deal more time. Jim – It’s not that we necessarily want to be the world’s best compulsories fliers, which we kind of do want to be, but it just really tightens us up. Jerry – It brought us together. Well, wow… I feel sated, almost full somehow! Thank you very much for being so frank with us, and sharing a great deal of your experience with all of the readers here at Kitelife! I have no doubt your story will fuel quite a few teams for years to come, and we wish you the very best of luck in your 2006 season. Jim – Thanks John, It was fun doing the interview and trying to dig back through the years of experiences, to put them into words that others may understand. I certainly hope someone gets something out of it, and it would certainly make it a full circle if someone that has been thinking about pairs or teams gets some inspiration from it, and does it. Next weekend we head up to Steveston in Canada, and the journey continues. 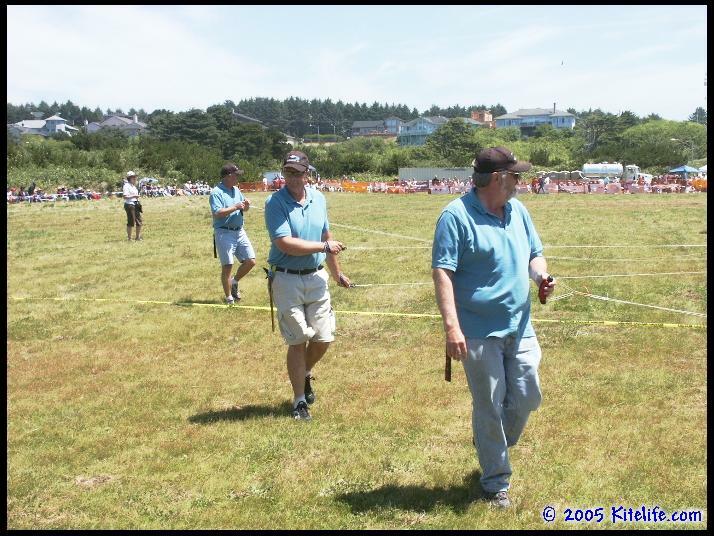 This entry was posted in 2005, Dual Line, Issue 43 (Jul/Aug), KL Archive and tagged cutting edge, profile, skc, sport kite, team.